The cytochrome P450s are a large enzyme superfamily in plants. They are named after the 450-nm absorption maximum of the carbon monoxide-bound form of the protein. The P450 superfamily shows a great deal of amino acid sequence diversity, with some members having as little as 20% amino acid identity with each other. However, key amino acid residues and structures involved in binding the heme cofactor required for activity are conserved (Graham and Petersen 1999). Most plant P450s are likely to reside in the ER membrane, although examples of mitochondrial and plas-tidic P450s have also been found. A hydrophobic domain at the N-terminus of ER-localised P450s acts as the targeting sequence and also as a membrane anchor (Fig. 1). The membrane anchor is followed by a cluster of basic residues (a stop-transfer signal) and often a hinge region containing a cluster of prolines. The remainder of the protein, including the heme-binding motifs and substrate recognition sites, is termed the globular domain and is located on the cytosolic side of the ER membrane. The P450s catalyse a wide range of oxidation reactions in primary and secondary metabolic pathways. In Arabidopsis there are approximately 272 cytochrome P450-encoding genes or pseudogenes and in rice there are 455 (Nelson et al. 2004). P450s are classified and named according to their amino acid sequence identity, gene structure and phylogeny (Nelson et al. 1996) into families (generally proteins with greater than 40% amino acid identity) and subfamilies (proteins with greater than 55% amino acid identity); for example, CYP701A3 is in family 701, subfamily A, gene number 3 in the subfamily. Plant P450s have been divided into two branches based on their amino acid sequences. The A type appears to be plant-specific, while the non-A types are more closely related to the P450s of other organisms. The P450s have diversified in plants to carry out a wide range of metabolic functions (Schuler and Werck-Reichhart 2003). Cytochrome P450s require a number of other factors for activity. The protein itself binds a heme molecule, which is essential for activity. The P450s usually require one of a small family of ER-anchored NADPH-dependent P450 reductases for electron transfer from NADPH to the catalytic site of the P450. The requirement of these additional factors is one reason why many of the plant P450s have no assigned function. The most popular method of defining plant P450 function has been to express the cDNA for the P450 in yeast strains that also express one of two Arabidopsis cytochrome P450 reductases (Urban et al. 1994). This has been successful for a number of the P450s implicated in plant hormone biosynthesis (e.g. P450s in the GA biosynthetic and ABA catabolic pathways), but there are many cases where this approach has not been successful (e.g. a number of steps in the BR biosynthesis pathway). In these latter cases, determination of P450 function has relied on comparisons of measurements of biosynthetic intermediates in mutants against wild type or restoration of mutant phenotypes following the application of biosynthetic intermediates to the mutant plant. Abscisic acid (ABA) is a sesquiterpenoid hormone which has roles in many developmental processes and environmental responses. It is particularly important in dormancy, germination and stress responses. ABA is derived from carotenoid precursors, with the biosynthesis pathway split between early steps in the plastid and late cytosolic steps. As with other plant hormones, the catabolism of ABA is important in controlling cellular ABA concentration. Physiological analysis had suggested that a cytochrome P450 was responsible for the first step of ABA inactivation to give 8'-hydroxy ABA, an unstable intermediate that is rapidly converted to phaseic acid (PA) either enzymatically or spontaneously (Fig. 2). The CYP707A P450 subfamily was identified as being up-regulated in response to ABA application in Arabidopsis using a microarray approach. All four members of the subfamily in Arabidopsis were shown to be ABA 8'-hydroxylases by functional expression in yeast (Kushiro et al. 2004), with PA being produced when the yeast was fed with ABA. Of the Arabidopsis CYP707A subfamily, CYP707A2 is most highly expressed in dry seed and its expression is rapidly induced following seed imbibition, suggesting that this enzyme may be important in reducing the ABA content of seeds to allow germination. Consistent with this, knockout mutants of CYP707A2 show increased seed dormancy and have increased seed ABA content. ABA levels also increase in plants exposed to dehydration stress; in parallel with the ABA increase there is a moderate induction of all four Arabidopsis CYP707A subfamily members. When plants are rehydrated, ABA levels are reduced at the same time as large increases in expression of the four CYP707A subfamily members occur. As all four CYP707As appear to be involved in the dehydration response they are likely to be functionally redundant, and consistent with this no phenotypes related to dehydration stress have been observed in knockout plants of the CYP707A subfamily. The evidence to date therefore suggests that ER-localised P450s play an important role in the control of ABA concentration, both in maintaining ABA homeostasis and in ABA-mediated developmental and environmental responses. 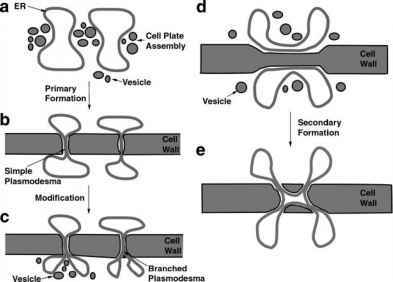 The hormone auxin has been studied since the nineteenth century, and has been associated with a number of processes including apical dominance, shoot elongation, root initiation, cambial division and various tropisms. The main auxin in plants is indole-3-acetic acid (IAA). IAA can be syn-thesised from tryptophan and other precursors by a number of different pathways. All the individual pathways may not be present in one species and the relative contributions to the IAA pool from the different pathways can vary during the development of the plant. Members of two families of cytochrome P450 enzyme have been associated with IAA biosynthesis from tryptophan (Fig. 3): CYP79B2/B3 and CYP83B1. CYP79B2 and B3 were isolated as a result of a screen of yeast expressing Arabidopsis cDNAs for resistance to 5-fluoroindole, which is converted to the toxic 5-fluorotryptophan by yeast (Hull et al. 2000). Yeasts expressing CYP79B2 were resistant to 5-fluorotryptophan, presumably as they were able to metabolise the toxic 5-fluorotryptophan. Bacterially expressed protein was assayed in a reconstituted membrane system, and both CYP79B2 and the related CYP79B3 were shown to convert tryptophan to indole-3-acetaldoxime. Indole-3-acetaldoxime is a branch point between the IAA and glucosinolate biosynthesis pathways (Fig. 3). expected or is one of the rare cases of chloroplast location. There is little information about the biological roles of CYP79B2 and B3. CYP79B2 is pathogen induced, which may indicate a defence role for this P450 which could be via auxin and/or glucosinolates (glucosinolates break down to toxic compounds upon herbivore attack). The second P450 with a role in auxin biosynthesis is CYP83B1. The P450 was identified from the sur2 mutant, which has elevated IAA levels (Barlier et al. 2000). 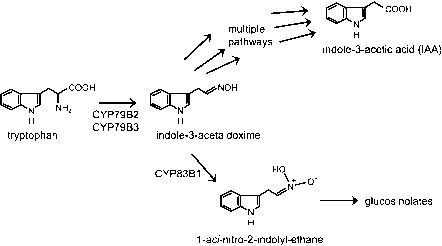 The enzymatic activity of CYP83B1 has been characterised by expression in yeast with a cytochrome P450 reductase, and was proposed to catalyse the first committed step of glucosamine synthesis from indole-3-acetaldoxime to 1-aci-nitro-2-indolyl-ethane (Bak et al. 2001; Fig. 3). The auxin-overproducing phenotype of sur2 is therefore thought to be a result of increased IAA biosynthesis due to a block in glucosino-late biosynthesis. This branch point may well be a crucial point of control of IAA biosynthesis, as increased IAA leads to increased expression of CYP83B1 mRNA (Barlier et al. 2000). This could be a feedback mechanism acting to maintain IAA homeostasis by diverting indole-3-acetaldoxime from the IAA pathway to the glucosinolate pathway.